Scene: Living room of a Manhattan apartment on the Upper West Side. Characters: One exhausted mother. 18-month-old boy and girl twins. The afternoon light is fading but manages to warm my body in a final burst of sunshine. I’m seated on the living room rug, legs stretched out, watching my son Casey and daughter Rebecca play at their toy kitchen. They are delighted to serve me rubber bacon and eggs. In this moment they are happy, unaware, or so it seems, of the gravity of our lives. In this moment I am lifted by the wonder of them. Nothing has come easy for my children, including their lives. Conceived after three cycles of in vitro fertilization and born prematurely at 30 weeks, their feistiness has proven to be a blessing. They spent six weeks in the neonatal intensive care unit housed in adjacent incubators. In the beginning it was terrifying. But infections and low birth weights and breathing troubles weren’t the worst of our problems. My husband Brett and I were also given the starkest of news on the very day our twins were born on May 20, 2001. Only hours after becoming parents, we learned that his cancer had returned. The “routine” MRI he’d taken a few days prior (the one that was clean for almost two years) revealed an explosion of tumor growth. From that day forward, my children grasped onto life and Brett began his slow descent. Eventually his symptoms rendered him a shell of the man he once was. Gaunt. Confused. Silent. When it was all over and at last he died at Calvary Hospice in Bronx, New York in February 2004, his death was almost merciful. For him, for me, and for our children, whose anxiety was palpable. Rebecca tore chunks of hair out while Casey walked on his toes and sometimes sprawled his small body at the foot of the door where his dad once slept. The twins had no idea what death meant. How could they? They weren’t even three years old. We had a wonderful social worker named Jill who drew black and white stick figures of “Brett” at the hospice, at his funeral, and in his final resting place at the cemetery. Jill and I explained in the most concrete terms that when people die they don’t walk or talk or breathe. So, no, Daddy wouldn’t be able to join us for car rides. And no, he really wasn’t hiding. Much as we all loved him and missed him, he couldn’t come back home to our apartment so we shouldn’t expect to see him walk through the front door. His body now lay beneath the ground in a special box called a coffin. Yes, we can visit him but no, we can’t actually see him. The twins wanted so badly to believe our words, even though this kind of acceptance takes time. I knew we were making progress when I overhead Rebecca remark that even the window looked sad. Gradually she was moving from the literal to the abstract. Death, of course, is both literal and abstract; it leaves a crater in the physical world, opening up an even larger space to mine in the spiritual one. One day, some six months after Brett died, we drove by a cemetery in Easton, Connecticut near my parent’s house. We’d gone to Easton for the weekend, as we did on many weekends, to be comforted by doting grandparents here and in neighboring Fairfield. “Look, there’s a cemetery,” I pointed out. “Is that where Daddy is?” Rebecca asked. “Daddy is in the sky,” answered Casey. Wait. What did he just say? I remember thinking. “Is the sky back that way Mama?” Rebecca wanted to know. She was referring to New York City. Just. Like. That. My three-year-old twins, whose own hearts and security in the world had been torn asunder, had made a critical connection. Even though their dad wasn’t physically with us anymore, his love was still everywhere. I gripped my gloved hands tight around the steering wheel and smiled. Their logic was so simple and profound that even I could make sense of it amid my foggy grief. I knew no other young widowed mothers at the time whom I could turn to for support, and while family on both sides and dear friends gathered round to help in innumerable ways, the cloak of otherness I wore as a young widow with small children overwhelmed me. Forget about reading the litany of books on healing well-meaning friends sent. I couldn’t read, couldn’t plan for any kind of future, couldn’t do much of anything in those early months but walk around in a daze and love the heck out of my babies. Which was enough. Still, in the powerful words of my children, I felt something new. Hope. It was hope tinged with the gray reality of the present, but it was still hope. Because they were right. The sky really is everywhere. This article is graciously contributed by Nancy Sharp, keynote speaker, trainer, and award-winning author focused on resiliency in the workplace. 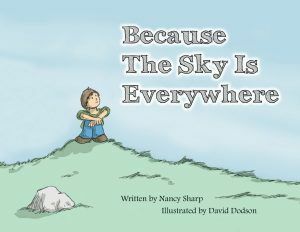 Nancy holds an MFA in Creative Nonfiction and authored the bestselling memoir Both Sides Now: A True Story of Love, Loss, and Bold Living, recipient of the Colorado Book Award, and a book for children and families called Because the Sky is Everywhere. She is widely published in national media and lives in Denver, CO (how she got there is a story of resilience). Learn more at www.NancySharp.net. What Do You Say When Your Best Friend Has Cancer?